Many California educators are preparing for a new English learner assessment called the ELPAC, and wondering how it compares with the ELA portion of CAASPP. 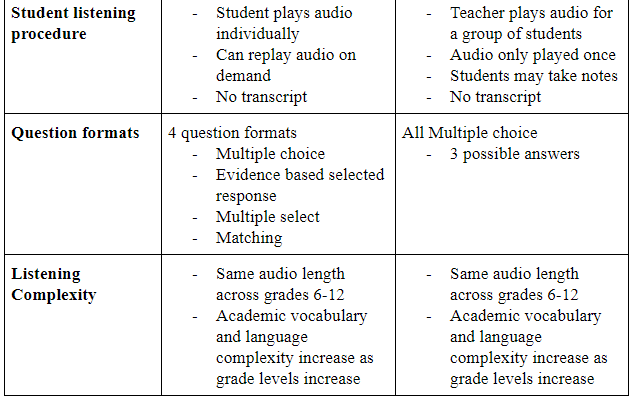 We looked at the listening strand samples and practice tests for grades 5-12. Despite the fact that both tests are assessing listening comprehension, they go about it in somewhat different ways. The two most significant differences between the assessments are the type of audio that is listened to and the listening procedures. CAASPP listening passages are short informational texts that are read aloud by one speaker. The passages are typically related to common grade-level curriculum topics. You can listen to a sample audio passage from CAASPP 5th grade (about 1½ minutes long) about asteroids and space. In contrast, the ELPAC listening segments are conversations, more similar to spoken English that a student would encounter in the classroom. There are 4 different types of listening segments that range in length and complexity (see chart below). The ELPAC practice tests do not provide the audio files, only transcripts of the conversations. 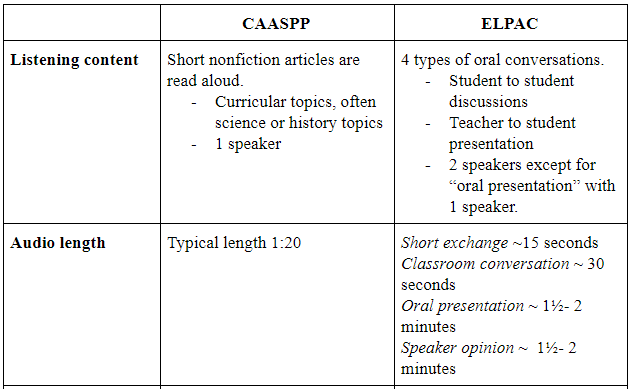 The “oral presentation” type of question on the ELPAC is the most similar to the CAASPP, as it features a teacher talking about a curriculum topic. All the other ELPAC listening tasks feature 2 different speakers. The other significant difference in the tests is in how the students listen. In the CAASPP, students can each listen to the streamed audio individually and replay the audio as desired, using an embedded notepad to take notes as they listen. However, ELPAC audio will be played only one time for a group of students being tested. The ELPAC instructions do encourage students to take notes on paper while listening to the longer segments which are similar in length to the CAASPP items. With these differences between the exams, you might wonder if it is possible to prepare for both without double the effort. It definitely is! Certainly having students practice listening to audio related to curriculum topics can help students prepare for both the CAASPP and the oral presentation and speaker opinion task types on the ELPAC. Also, audio dialogue that discusses opinions and points of view on a current topic are very useful, especially for ELPAC. Using a solution like Listenwise, teachers can assess student listening comprehension (try a sample test to see the format of our listening comprehension assessments at this link) with formative quizzes or have students practice note-taking with organizers and short response questions. At the outset, students will benefit from supported access to challenging content, such as being able to read the transcript as they listen or look up unfamiliar words. However, teachers can hide the transcript when they want to more closely model the tests. For teachers with students taking the ELPAC, some practice should also be given with audio stories played once from the front of the classroom, not just students listening on their own. This webinar excerpt shows how the CAASPP and Listenwise interfaces are similar, and how one CA teacher uses Listenwise to support student practice for these listening tests. Try Listenwise Premium for free for 30 days!